As CEO of the youth volunteering organization Do Something, Nancy Lublin has overseen its dramatic growth since 2003. She helped it evolve from a debt-ridden, stodgy not-for-profit to a fast-moving, buzz-driven magnet for teens. Do Something now draws more than one million monthly hits on its Web site, while dispensing millions in grant money to young people with good ideas and a hunger to help others. Lublin now shows why the best not-for-profits are brilliant at doing more with less and what the mainstream business world can learn from them, especially in tough times. For instance, organizations like Do Something are tops at motivating people with nonfinancial incentives and doing effective grassroots marketing on a shoestring budget. Lublin's book distills the best lessons and stories from her career and includes interviews with other leaders of flourishing not-for-profits, such as Wendy Kopp of Teach for America, Adam Sterling of Save Darfur, and John Lilly of Mozilla. "Nancy Lublin has brought so much energy to the non-profit sector and the world is a much better place because of it. I'm so glad she wrote a book to give us all a window into how she thinks and makes things happen. Regardless of your professional sector, you'll find Zilch full of inspiration and great ideas." "Nancy's great energy and experience come through in her book as she provides great lessons for business and life to be more effective. Nancy's 11 question approach is a great way to make you think about how her principles apply to what we do everyday in business. I enjoyed the book and am already thinking about how I can do more with less." -Ken Hicks, president and CEO, Foot Locker, Inc.
"Anyone who can start an internationally respected not-for-profit with just $5,000 has a lot to teach today's business world. Inspiring and practical, this book is a must read for anyone running a business. Including me." "Nancy Lublin is a star! She knows how to really make a difference in a most efficient and pragmatic way...and now teaches us how to do it!" "Nancy Lublin has done the uptight business world a big favor. Borrowing from her experience as found of Dress for Success and now CEO of Do Something, Nancy lays out a strategy for business success in the simplest terms. It's a smart, sassy, and plain spoken book full of great ideas on his to run a for-profit company. Using compelling anecdotes for her 'not-for-profit' world, Nancy's amazing energy and imagination comes through in every chapter. Zilch is a no nonsense survival manual for fat cats." 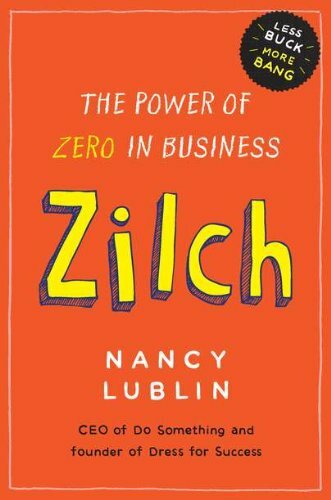 "In a reset world, Zilch provides a timely approach for operating in the 'New Normal'. Nancy Lublin's expansive nonprofit experience provides rich organizational insights for businesses of all sizes." Nancy Lublin is the CEO and “Chief Old Person” of DoSomething.org, which uses technology and pop culture to help young people “rock causes they care about.” Previously, she was founder and CEO of Dress for Success, which she started at age twenty-three. Lublin has won numerous honors and is frequently quoted in the media. She’s a contributing columnist for Fast Company and an adjunct faculty member at New York University and Yale School of Management. She lives with her family in New York City.